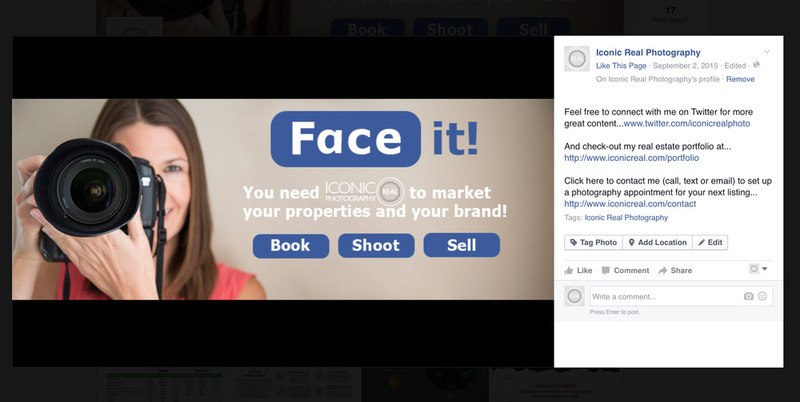 Iconic Real Photography — Realtors: How to set up a Real Estate Business Page on Facebook! Realtors: How to Enhance Your Brand on Facebook! If your thinking I don’t need a Facebook Business Page because I already have a Facebook profile and that’s where all my friends are then you need to gain a better understanding of how a Facebook Page can help boost your brand awareness and promote your Real Estate expertise to existing and potential clients. You can actually use your profile and a business page hand in hand to effectively market yourself. Check out this article which describes the different functionalities of both and why having a business page is important: Facebook Business Page Debate. 1. Go to facebook.com and log-in to your personal profile. 2. Go to the top right of your profile page and click the little down arrow then select “Create Page”. 3. Select “Local Business or Place” and then “Real Estate” as your category. You will have the chance to add subcategories to further define your business later. Enter your business name, office address and contact phone number then click the “Get Started” button. Note: Selecting “Local Business or Place” allows you to enable Facebook Reviews and select from numerous Call-to-Action options which can assist with lead generation or providing information and tools to your clients. We will set up these functionalities in a bit. 4. Complete Sections 1-3 (See notes below). You can skip Section 4 as you have no other Pages to claim since this is most likely your first one. Leave 5 (Preferred Page Audience) at the default settings. I will show you how to Enable Audience Targeting later in this post. This will allow you to target each post's audience, if you so desire, verses setting up the audience for your entire page. Don't forget to click the “Save” button at bottom. Section 1. About: When adding a description use popular keywords that describe your business to improve search ranking. Add a website address. Think carefully when choosing a Facebook web address as you can only change this once. Make it something that represents your business, but is easy to remember so you can share this with the rest of your contact info. Spaced and underscores are not allowed. Section 2. Profile Picture: Size your profile photo at 180px X 180px. As a Realtor it is best to use a professional headshot verses your logo. Unless you are creating a page for a Real Estate Team. Then use your team logo here and add a team picture as your cover photo. If you want to modify this later you can simply move mouse over the photo on your new page and the option to “Update Profile Picture” will appear. Section 3. Add to Favorite: Enabling this allows easy access to your new business page later from your personal profile home page. 5. Click the "About" menu option located directly under your future cover photo. Right next to the the word "Timeline". Review all sections and complete any that you feel will enhance your brand presence on your business page. Ensure that you add "Subcategories" to further define the products and services your business provides by moving your mouse over the word "Subcategories". An edit pencil icon will appear on the right. Click the icon. In the empty dialog box start typing the words "Real Estate". As you do many other subcategories will appear. Select three that most closely align with your business. Follow these steps to Enable Reviews. 6. Go to the top right on your new business page and click “Settings” Review all sections and ensure they are set-up to meet your business, content and privacy needs. Follow these steps to Enable Audience Targeting. 7. Click the photo icon in the top left hand corner of page to add a cover photo. Check-out these creative Facebook cover photos to inspire you. Create a free account at canva.com to create an iconic cover photo for your business. You can even upload your own photos into your design; such as your Real Estate team photo, then add some creative elements. Your cover photo should be sized at 851px X 315px, which Canva already has templates for. Remember to leave the bottom 65px clear to allow for uncluttered view of your profile photo/logo, business name and Call-to-Action button. 8. Add a cover photo description by left clicking on your new cover photo to open the dialog box shown below. Next, click the edit pencil icon located right next to the "Add Location" button. I’ve chosen to add links to my Twitter account and website. It’s important to use all the “real estate” available on social media platforms to promote your business. This way when someone clicks on your cover photo they will immediately receive more information about your business. 10. Invite your Facebook profile friends to like your page. Click on the three little dots located next to the "Share" button right under your cover photo. Select "Invite Friends". You need 30 page "Likes" before you can start to see metrics in Facebook's free analytics tool, Page "Insights". Above is a quick table of all photo sizes on Facebook.